I love discovering and trying new restaurants. Of course, there are risks. But, the benefits of dining on the razor's edge far outweigh the disappointments. 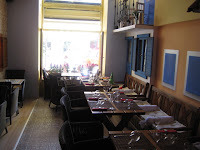 Recently, we got a tip that a Balkan restaurant had just opened in Malá Strana. We strapped on our dining gear and headed over. 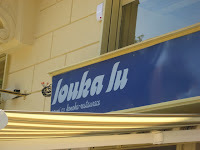 Louka Lu is on Újezd, and has four tables out in front. It does get a bit noisy there with all the trams going by on this busy route. 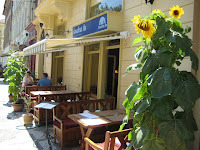 But, there were big sunflowers outside that added to the good feeling on a sunny Saturday. Inside, they've completely done over the space, with bright colors on the walls, interesting decorative tiles on the floors, and all new furniture and table settings. I believe it used to be occupied by a standard Czech pub. 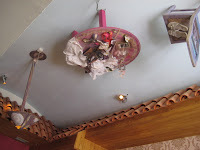 There area also a number of whimsical touches, like a pastel-painted little table, chair, and lamp attached to the ceiling. There is also a mini faux terrace above the dining area with little chairs on it. It was a little too cute and doll house-like for me, but it is easy enough to not look up. 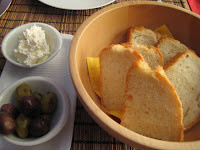 They bring good bread along with very intense black and green olives. On the side, there is a cheese similar to American cream cheese or Czech lučina. It is a nice alternative to butter. 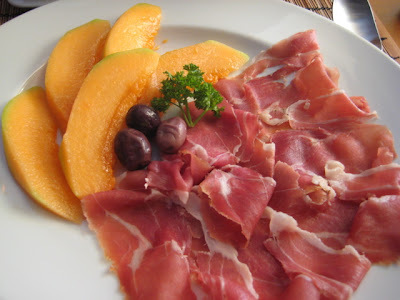 For a starter, I ordered the prosciutto and melon for 150 CZK. The prosciutto was moist and tender and the cantaloupe was the sweetest I've had in a very long time. This refreshing dish is often spoiled by unripe melon. Not here. If they can keep up the melon quality in winter, I'd order it more often. I love the contrast between sweet and salty. V got the grilled peppers with garlic and oil for 90 CZK. Served cold, this is another good summer appetizer. We liked it, but thought it could use a shot of vinegar. They weren't quite tart enough for our us. There is balsamic vinegar on the table that I liked very much. It is syrupy and on the sweet side. 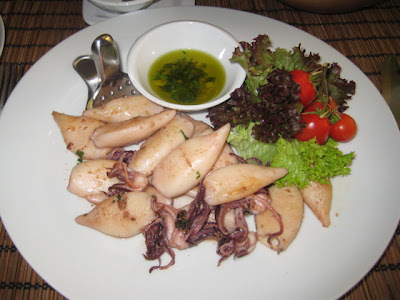 For a main course, I had the grilled calamari for 220 CZK. They were small, but fresh and tender, and there are about a dozen on the plate. There is also an olive oil, herb, and garlic dip, and a lemon wedge with a convenient metal squeezer. The waitress told us they were cooked on a lava grill, but I did wish there was a little more of a smoky flavor. I liked them a lot, but thought they were on the bland side. The olive oil didn't quite jazz it up enough for me, and there was only one small lemon wedge. So, I put a shot of the balsamic on the side of my plate. A little dip in there was exactly what I was looking for. Another nice touch was the cherry tomatoes on the side. They were left on the vine and lightly grilled so that they were slightly blackened on the bottom. The tomatoes also softened up and had great flavor. I also thought it was interesting that items like potatoes are not included with main course, but the waitress did not suggest or press that we order any. As it was, I was didn't want anything, but I thought it could slip by you if you are not paying attention. If you want a side with your main course, it is up to you to order it. 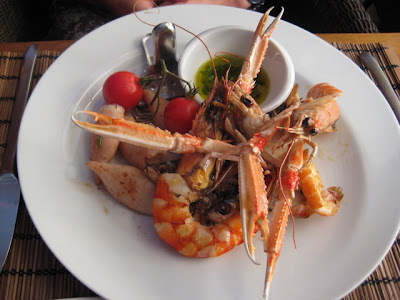 V ordered the seafood mixed grill. It came with crayfish, prawns, and calamari. They seemed to pick up more of the flavor from the grill. 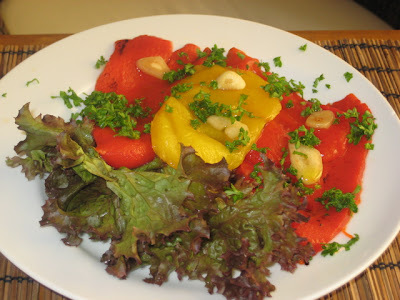 The plate also had the grilled tomatoes, olive oil mixture, and lemon wedge on the side. The waitress brought a finger bowl for cleaning up. ordered the house red wine, which was 50 CZK a glass. She said it was very good. I forgot to ask if it was Croatian. Finally, we really enjoyed the Croatian music they played over the sound system. There were several different styles, from classic folk songs to more stylish, jazz influenced tunes. When we are wandering in the area and spontaneously looking for something to eat, we almost always end up at Cafe Savoy. This particular area of Malá Strana has a handful of other decent restaurants, but it is not exactly overflowing with quality, mid-range choices. It's not exceptional, but we like Louka Lu. I think a few Praguers and out-of-town visitors will, too. I don't know if we'll make regular plans to go, but when we are in the neighborhood, I'm sure we'll be experimenting there again. For another perspective, you can read The Prague Post's review of the same restaurant, written a month after this post. The upside down chair sounds like a tribute to Dolly Bell over in Vyšehrad. 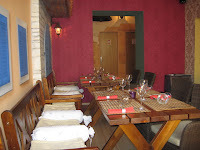 Glad to hear about the restaurant though, it is nice to have a new option in the Ujezd area! Please, visit our site and let us know if you have any concerns. Please, use our link as well if you like our site. Personally I adore this restaurant, the fresh bread and kajmak - the cevapcici - all reminds me of a great summer I spent in Montenegro with a group of czech/slovak/american/serbs. I love that it has such a unique and different feel as soon as you get there. I suggest to anyone to give it try!